Inspiration for our homes can come from all places, and right now our friends over at California Home + Design are looking to some of the Golden State's most dazzling hotels for a few decor ideas. And, they show us it's all in the small details of a room. So, while installing a spa may be the stuff of dreams, it doesn't mean we can't borrow the other great design features of some of the most forward-thinking hotels out there. Whether it's using a wood ladder as an alternative to a typical coat rack or outfitting a room with canvas curtain dividers for an inexpensive alternative to dividers, these spaces are inspiring us in surprising ways. Check out the slideshow below to see some of the hotel rooms that caught the eye of our friends over at California Home + Design. All photos courtesy of California Home + Design. Would you want your home to feel like these hotels? Let us know in comments below. For the full article and more images, head over to California Home + Design. 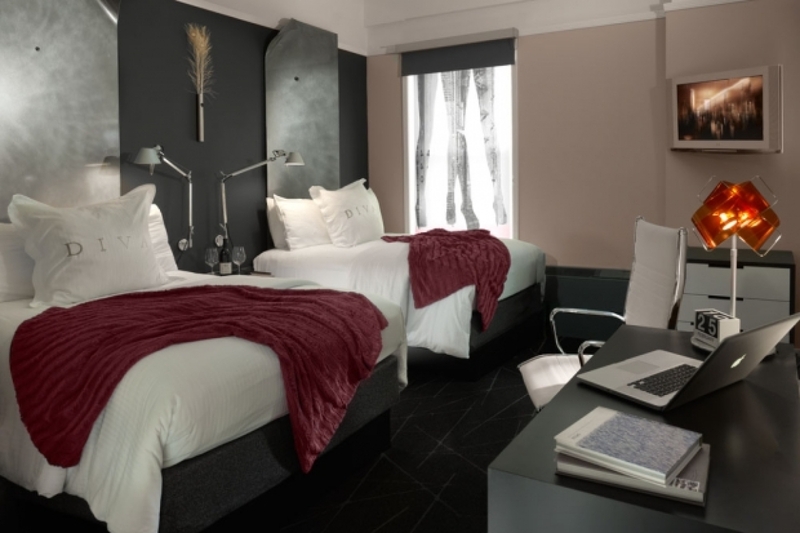 Sheet metal headboards and hanging curtains printed with silhouettes make thoroughly modern accents in the <a href="http://www.hoteldiva.com/" target="_hplink">Hotel Diva</a> in downtown San Francisco . To achieve a similar industrial appeal in your home, consider unusual accents like steel finishes and graphic curtains to give a room a light and airy atmosphere.